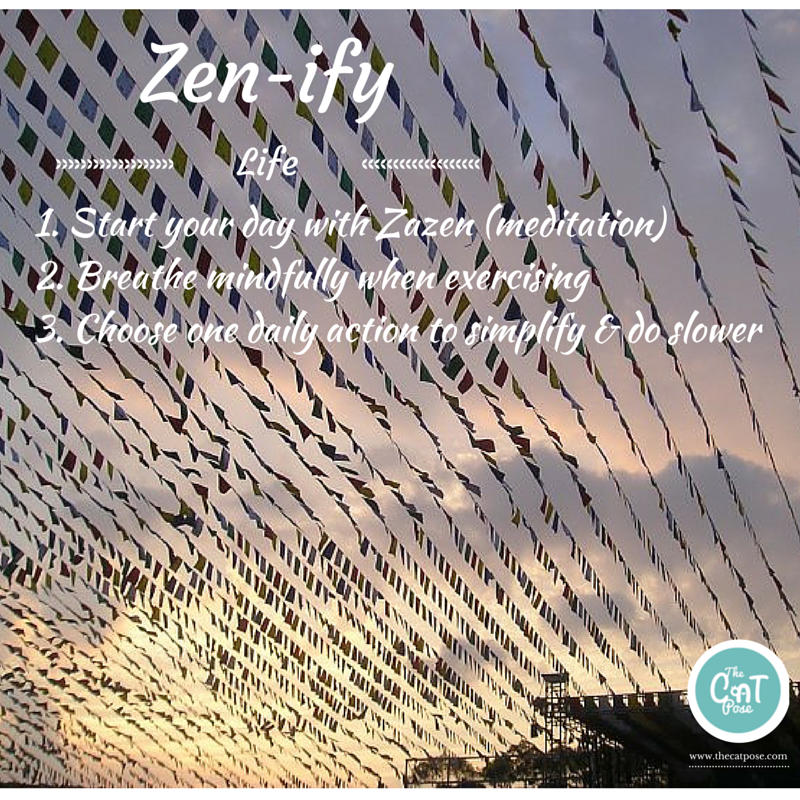 Zen Yoga: Breathe, love and Zen-ify your life....plus have #CheongsamConfidence! Whether you happen to be rich, poor, big, small, tall, short, female or male....there is bound to be moments in life where you search for meaning in whatever you do or live. Almost like an instinct ingrained within our deep soulful minds, we roam and seach for that piece of clarity....the meaning in our lives. Maybe it affects our sense of worth, maybe it is part of how perfect we see ourselves, or maybe it is just a way to prove we have some sort of inner beauty? Either way, it is a subjective and personal journey for each and every being who seeks this proof of value within ourselves. The question is; if we truly did love and value ourselves why can we not overcome lengths of body neglect, low self-esteem or even self-harm? What does justifying meaning in our lives really mean? More often than not I hear reasons from beautiful ladies claiming their fear of wearing the Qipao (Cheongsam) as though it is the hardest dress to wear in the world....this is exactly the reason why I continue to write about the Qipao, answer questions as well as messages on the Qipao, and in fact turned the Cheongsam (Qipao) to become the main focus of my blog. The message I have always wanted to give other fellow females remains the same; YOU wear the Qipao (Cheongsam)! The Qipao originally began as a handmade tailored dress especially made for the body of one single female, so the dress was made to fit the lady and not the other way round. Writing for as many years as I have about the Qipao, I hope to help you find ways to uncover the right Qipao for your body in this off-the-rack high speed mass production world, or make a Qipao into your Cheongsam. [Qipao Love] It is also why I decided to open up in starting to review modern Qipao dresses too, because there is no one dress fits all in existence. We are all different and all unique. Inspire a 'body positive image' with yoga and meditation posts focused on your physical as well as mental wellbeing. Help you build confidence in overcoming your perceived barriers through styling the Qipao to embrace your beauty...in a vintage way. Share knowledge and be a resource to you when it comes to everything about the Qipao (Cheongsam)...before it becomes a dying art one day. ......and will be backing my message with a mini-campaign for women called 'Cheongsam Confidence'. So I invite you my darling readers to join this search for meaningful clarity, body positivity and indulgence in love for yourself as a truly living being. I suggest we start by disecting our daily rituals, which seem psychologically ingrained within us in becoming natural habits to life, but what do they really mean? When you brush your teeth in a rush whilst checking off your to-do list in your mind, you are likely to forget how many minutes or even if you have brushed all your teeth properly. In a fast paced world we are used to multi-tasking, but it doesn't mean we are more productive or even more efficient by doing so. As one can argue we have become too busily distracted that even taking 2 minutes to care for our teeth, which will stay a lifetime with us if kept healthy, has become too much of an investment in time. Question is; if 2 minutes is too much time to invest in you, then what meaning are you subconsciously enforcing to yourself? 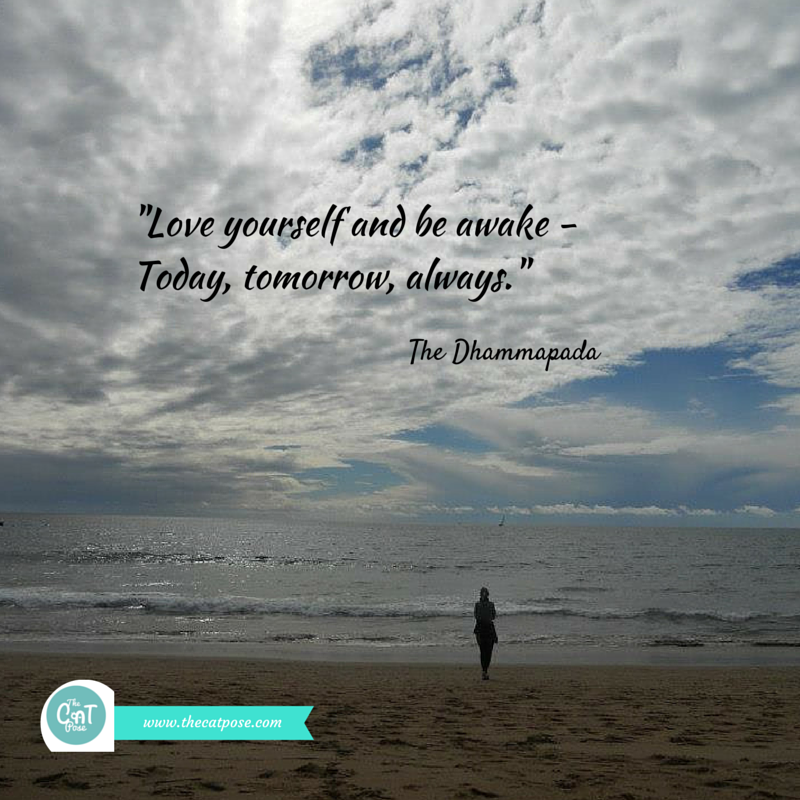 This is of course a rather rashly simple example, but the essence of the message is to be mindfully present in every moment of your own life and take care of the you that you should love....for you only have one body. Have a go at simplifying your life a little with the 3 steps in the picture (above), inspired by the Buddhist Zen tradition but applicable to all. You could even use prayer in your faith or just simple thinking or reflection time to start your day consciously breathing (step one). It is simply a method anyone can use to benefit their own wellbeing, and you really have nothing to lose by trying to breathe more. [For more on Zen living take a look at this YouTube video 'A day in the life of a Zen monk' by EmptyMind Films] Remember the videos I pledged to create in raising funds for charity last year? In the following weeks, I shall start to reveal some videos that are currently in the pipeline to help you enrich your body positivity and body confidence....in an aim to banishing the "I can't wear a Qipao because" reasons. I sincerely hope that after a months time, you darlings will join me in 'Cheongsam Confidence' to make a decision towards positive body image, loving the Qipao and more importantly honouring yourself with love for yourself.....after all a dress designed for women should not be a barrier to women! 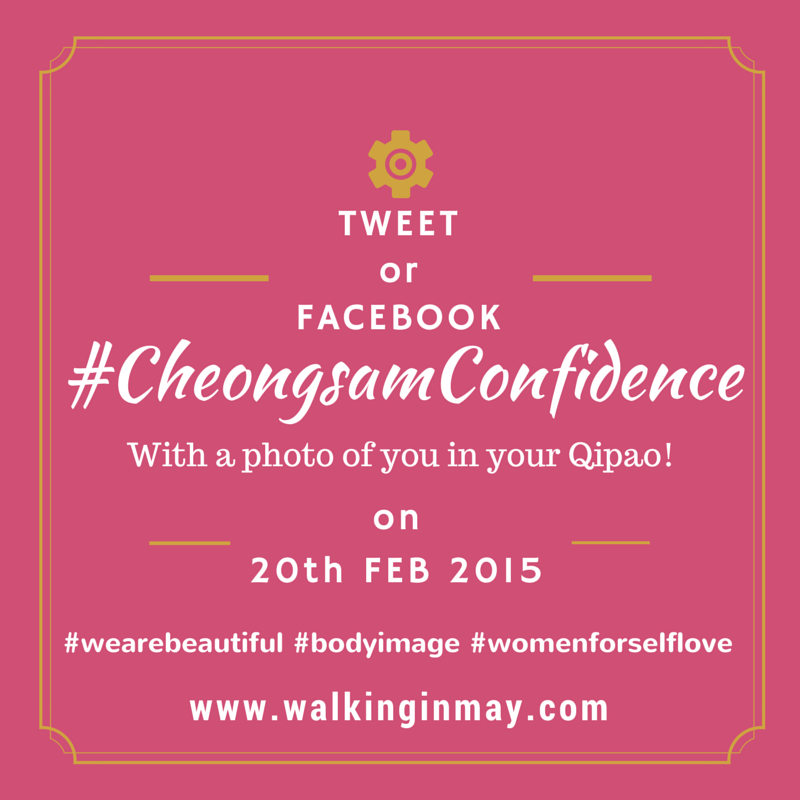 Share and spread the word....you're invited to be #CheongsamConfident! Also join the Google Hangout session (probably beginning of February), where those interested can join to have a Q&A or discussion....in asking any Cheongsam styling questions! Let's wear the Cheongsam (Qipao) with purpose as well as love this Chinese New Year! Here's wishing you all a fabulously happy and confident week ahead! PS: Sharing is loving, and there's still time to enter the cat themed GIVEAWAY 2......hurry! I love this! It's such a wonderful idea. I greatly appreciate how you are tying in culture, true beauty, and vintage (if someone wants to wear it!) into this campaign!